This entry was posted in English and tagged church history, timeline. Bookmark the permalink. Still a work in progress. Love your feedback. This is amazing. May I share printed copies with my church study group (about 30 people)? We are studying the early church and this would be such a wonderful reference. By all means, Diana. I’m glad to hear it’s useful! Genius. Glad someone has done this! Thanks Mark. Cheers, Matt. Let me know if I’ve missed anything important. I just want to check the birth date of John Chrysostom. Is it really 374? not 347? Some website(wiki and …) show is birth date c. 347, his birth date is disputed though. Admire your efforts – i’ve been meaning to give this a go myself sometime but am always stumped by how to display the confusing fragmentation of the Roman empire. love the clarity of the timeline! Thanks for doing it! I’ve updated the timeline, Iggy. thanks mark. appreciate the effort! Thank you for your effort. I have something similar on the wall of my office (I’m a professor of biblical studies and early Christianity), but this simplified and electronic version is very helpful. Your timeline seems to imply that all the persecutions were empire wide or at least the totality of one half of the empire. It might be more helpful to be more granular in your representation of the persecutions seeing as only two persecutions were empire wide (see W. H. C. Frend). Thank you, Richard. I guess one of the downsides of aiming for simplicity is being overly simplistic. If I get a chance to review the timeline in the near future, I’ll have a look at how the persecutions are represented too. This is Fr. Arsenious, one of the Oriental Orthodox monks in TX. I came across your chart on the Early Church History and it looks amazing. I’m working on a timeline right now and I wanted to ask what program you used for your timeline? I’m working on adding everything you put plus the contemporary heresies to each time-period, the deans of the school of Alexandria and the Popes of Alexandria. If you are interested, you can lend me the actual work and I’ll add to it instead of recreating it. If not, telling the name of the software you used would be sufficient. Thank you so much, great great work indeed! Hi Fr. Arsenious. Great to hear from you and thanks for the encouragement. In answer to your question, I use Adobe InDesign for the layout of the graphics and Illustrator for the creation of any vector graphics needed. Thanks, Mark. Mark, I teach a history of Christianity class at a church in Atlanta, GA. 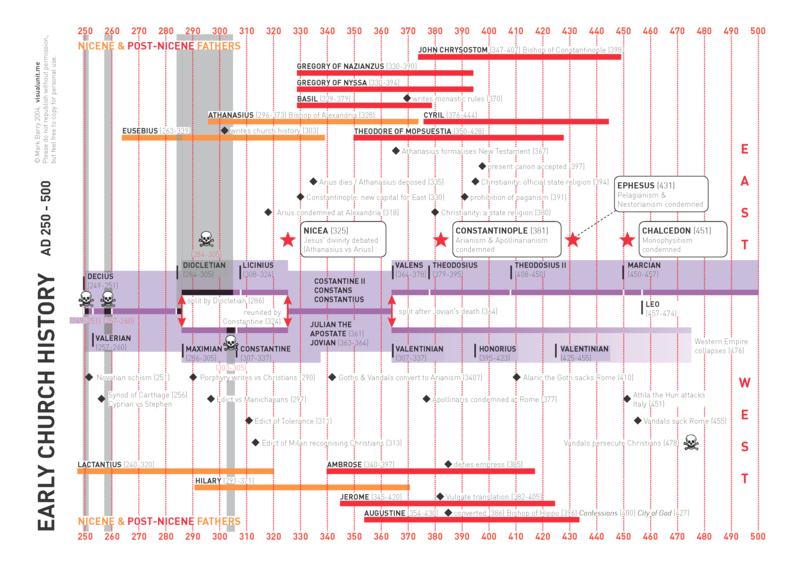 Your Early Church History timeline is fantastic and I’d like to make 60 printed copies for members of my class. May I do that? I’m amazed that you were able to get so much info on a couple of pages. Great work! Absolutely, John. I’m glad the timelines are helpful. Please let me know, if you find any errors! Mark, thanks for the permission. The only potential error I see at this point is the birth date of John Chrysostom. I think you may have reversed the 4 and 7. Most sources I read seem to agree that he was born around 347 instead of 374. Good pick-up, John. I’ll make the change. Thanks, Mark. 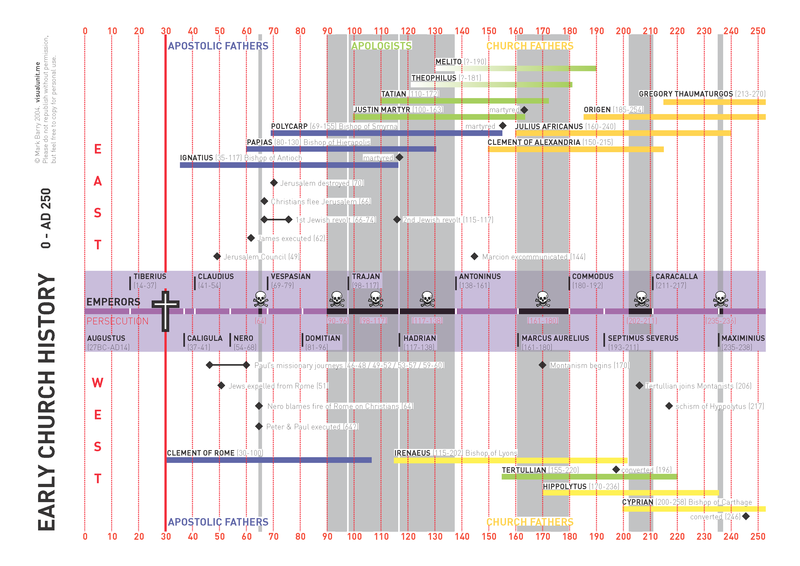 Hi – great timeline for Early Church History. I wonder if I can use this with my 5th grade students who are studying this?